The name Dromaeosauridae means "Running Lizards". They were bipedal carnivores that ranged greatly in size, from the small Velociraptor and Dromaeosaurus to the gigantic, recently-discovered Utahraptor. They were agile and quick, with grasping hands, and well-developed senses. For example, most dromaeosaurs had large eyes, for seeing in the dark. 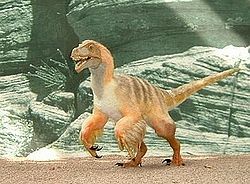 They, along with their close relatives, the troodontids, are characterized by having large, slashing toe claws on each of their hind feet. Most scientists now agree that these were used for killing prey. Many evolutionists now claim that dromaeosaurids, like many other types of dinosaurs, had feathers, and that they are the ancestors of birds. However, there is really no actual evidence to support this claim. First of all, almost all of the fossils that support this idea come from China, and China is known to have had a fake fossil industry, such as with what happened in the case of the "Archaeoraptor" hoax, where somebody merged the head of a bird to the body of a dinosaur, in order to create the appearance of an evolutionary "missing link". Second of all, even among the fossils that are genuine, none of them support the hypothesis that these creatures had feathers, or were related to birds, at all. Fossils of purported feathered "dinosaurs", such as Archaeopteryx, Protarchaeopteryx, Shuvuuia, Mononykus, Microraptor, Caudipteryx, and Similicaudipteryx, are really just extinct birds. Now, as for fossils that actually belong to dinosaurs, such as Sinosauropteryx and Sinornithosaurus, new studies indicate that the supposed "feathers" are actually just muscle tissues. And, so, we can now safely come to the conclusion that dromaeosaurids, and all other dinosaurs, did not have feathers, and were not the ancestors of modern birds, despite what the atheists say. This page was last modified on 29 July 2014, at 15:58.